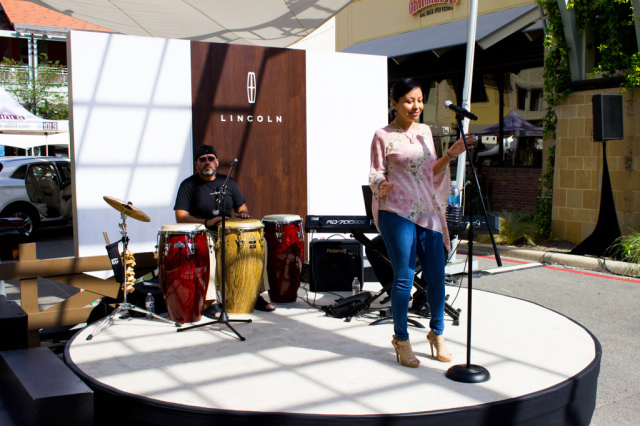 The Culinaria Jazz Brunch was the epitome of a classy Sunday afternoon. 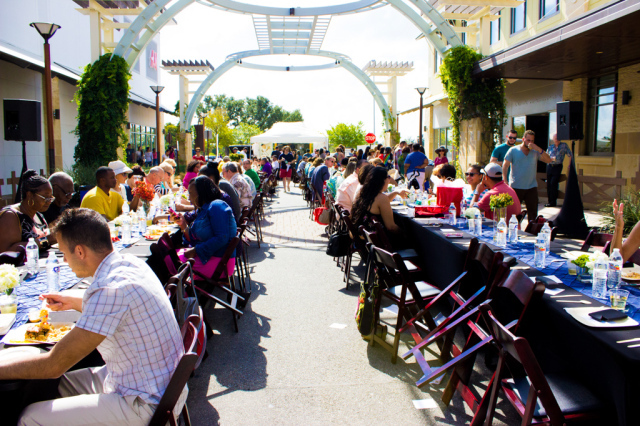 The sweet sound of jazz echoed throughout the corners of the shops of La Cantera, where the brunch was held. The food was prepared by Chef Rob Fleming of the Magnolia Pancake Haus. 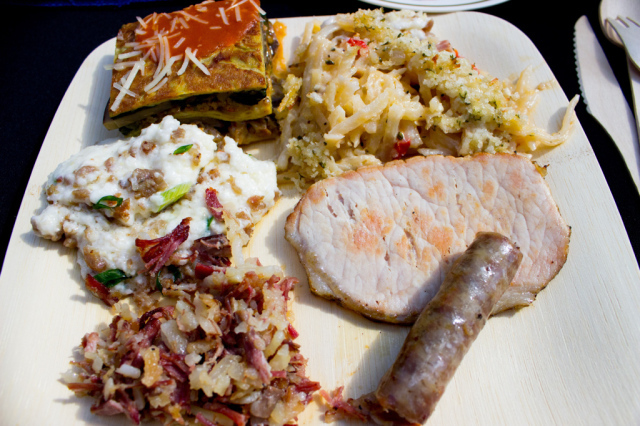 With elegant live music and the impressive selection of breakfast foods, the Jazz Brunch made for quite a mid-day event. People enjoying a fine day at the Culinaria Jazz Brunch. Photo by Jessica Luhrman. To my surprise ,breakfast foods and wine go well together! 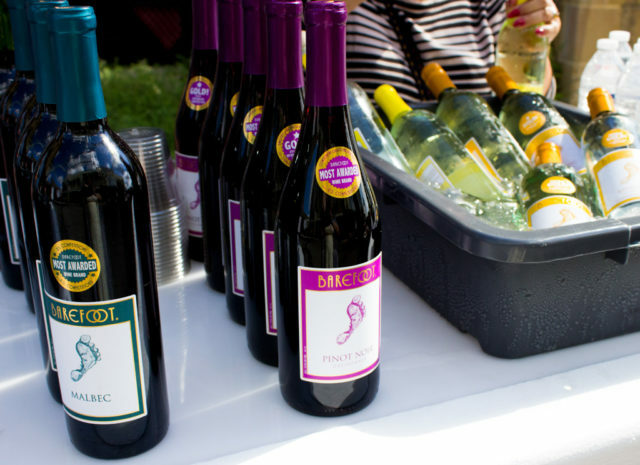 Guests had the option of choosing between several selections of wine from Barefoot Wine & Bubbly or coffee provided by Starbucks. I opted for a cup of the Riesling, a sweet fruit-filled wine that had the sweetness of apple and the tanginess of lemon. Barefoot wines and bubbly. Photo by Jessica Luhrman. While sitting and sipping my wine at one of the community-style tables, I noticed a line of my fellow brunch-mates forming. Eager to get a spot close to the front, I grabbed my plate and joined in the line where I noticed the most amazing aroma of pancakes and sausage. By the time I got to the front, I couldn’t wait to pile my plate high with as many breakfast foods as possible. My plate of breakfast foods! Photo by Jessica Luhrman. There were several stovetops set up with chefs preparing food before our very eyes. It was magnetic watching chefs make the food that was soon to be eaten. After making my choices, I sat down, enthusiastic to give everything a try. 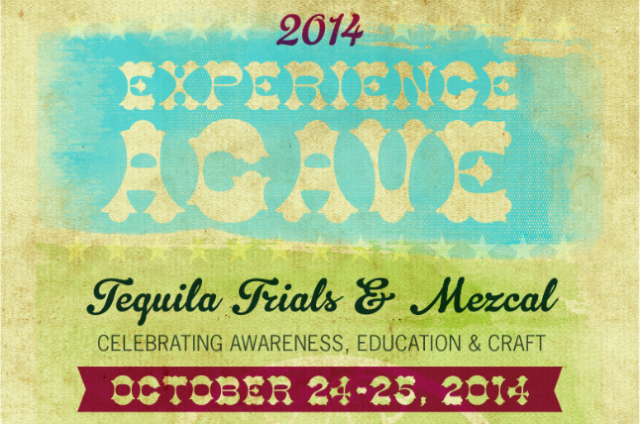 Experience Agave, Culinaria’s event all about tequila, is October 24 & 25! I turned towards my first course: the grits. This was my actually my first experience tasting grits and it turned out to be one of my favorite foods of the day. The gravy-like mixture was the perfect combination of the sultry flavor of the sausage and the sharpness of the green onions. While I was obsessing over the fantastic taste of the grits, I heard murmurs from other guests about the grits being their favorite choice as well. After demolishing all the grits in site, I moved on to my next selection: the breakfast lasagna. 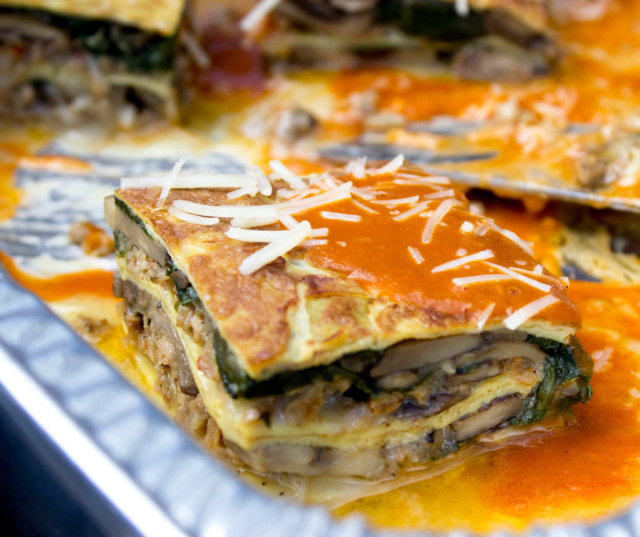 Hearing “breakfast lasagna” immediately sparked my intrigue—the dish was a layered assortment of egg crepes, caramelized onions, mushrooms, spinach, Italian sausage, several types of cheeses and a hearty tomato sauce. There was a spicy edge to the breakfast lasagna that contrasted well with the other breakfast foods. The breakfast lasagna. Photo by Jessica Luhrman. 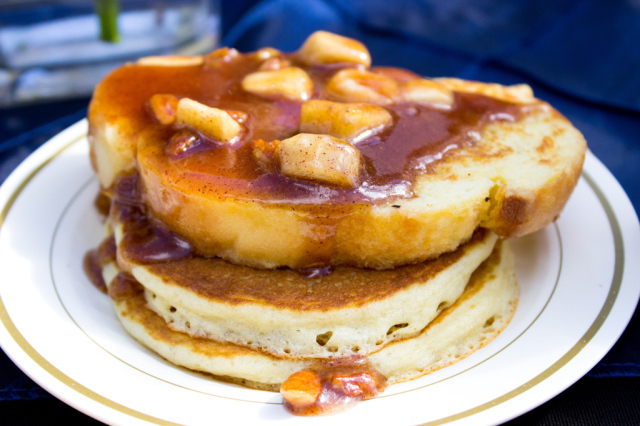 My favorite dish of the day was conclusively the banana foster pancakes and French toast. If you haven’t had banana foster sauce before, I recommend you run to your nearest breakfast haunt and order it ASAP. Okay, don’t run. But really—the banana foster sauce served up by the chefs of Magnolia Pancake Haus was delicious enough to seek out. The sauce was cinnamon infused rum based sauce with bits of banana and praline pieces layered throughout. I poured it on top of my pile of French toast and pancakes. Bananas foster French toast and pancakes. Photo by Jessica Luhrman. There were two selections of hash browns: the ham and the sausage casserole. I favored the latter and enjoyed the texture of the greasy sausage, pepper pieces and the creamy potato pieces together. After eating such intensely flavorful foods, I was left with a thirst that could only be quenched with something sweet and bubbly like champagne. A server came to my table and filled my glass with Barefoot Champagne that had the perfect amount of bubbly with a very smooth apple finish that was a refreshing way to end my meal. While sipping the final drops of my champagne, I stopped to listen to the live musician giving a phenomenal cover of Etta James’ “At Last”. With the sun shining down, the sweet aroma of breakfast foods in the air, and a happy filling of wine, champagne, and brunch foods, I must say the Jazz Brunch is a tradition I would be happy to continue. Gotta love all that jazz. Photo by Jessica Luhrman. Special thanks to Culinaria for providing tickets to this event. 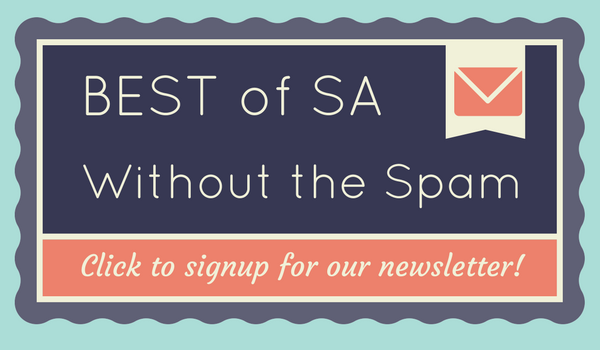 Be sure to check out their upcoming tequila events the weekend of October 24-25, 2014! Be sure to check out Eventbright to purchase any Culinaria tickets.